Beauty and reverie...: Ahoy there! On my travels this weekend I came across this gem of a find in a seaside charity shop! I don't care if the shoulder pads in this make me look an American football player - I love it! I found this navy shirt and swooped on it instantly. 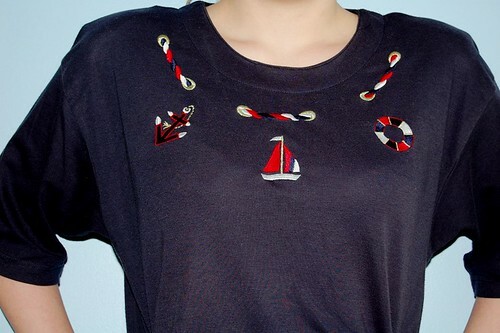 The embroidery playfully nods to the nautical which makes it perfect for summer. I'm looking forward to styling this already. Ok the size comes up pretty big and it's almost long enough to be a dress on me, but I don't care! The fact that this seaside souvenir was £1 is the reason why I thrift. Haha, I just thought they were a little square!